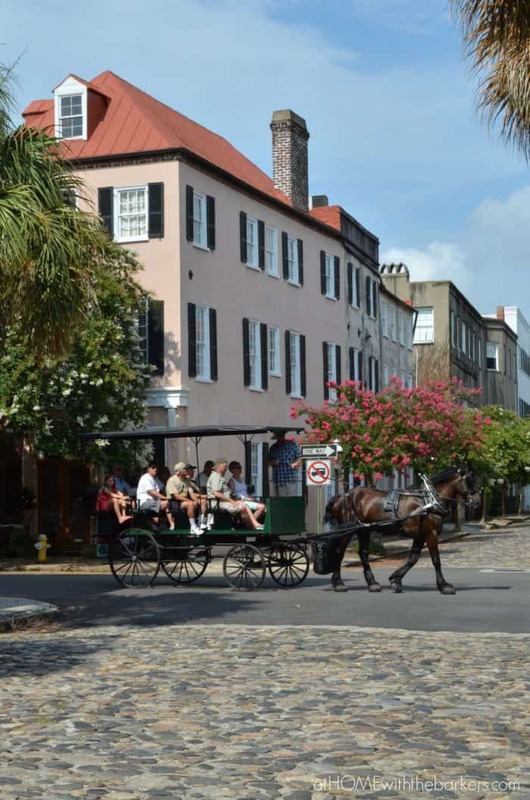 One of the best places to visit in the south is Charleston, South Carolina. 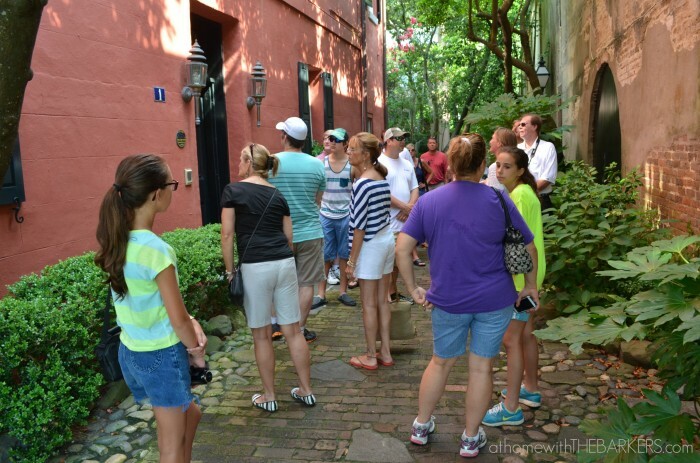 A Charleston tour is also best taken on foot by a local with loads of knowledge. Check out this post for a sampling of what you will learn. Get your walking shoes and camera ready. After being voted the #1 Best City in the World for 2016 by Travel + Leisure I knew I had to share this post again! 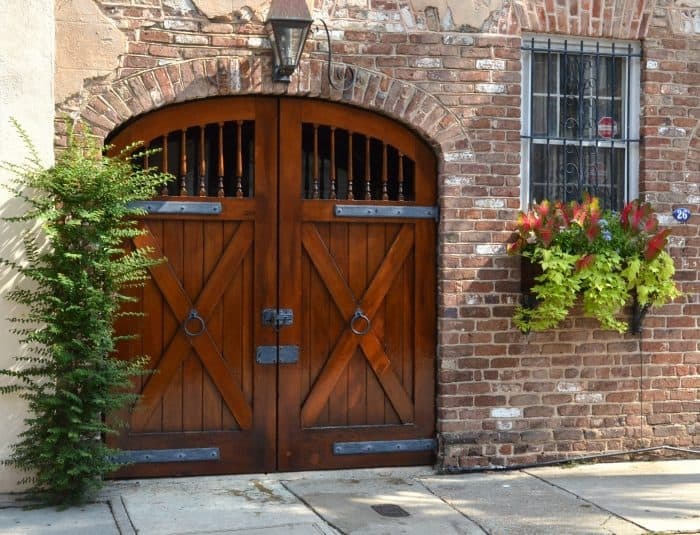 As a native South Carolinian, I already knew this was a special place but there is something you should know about Charleston, South Carolina…it is best viewed on foot. 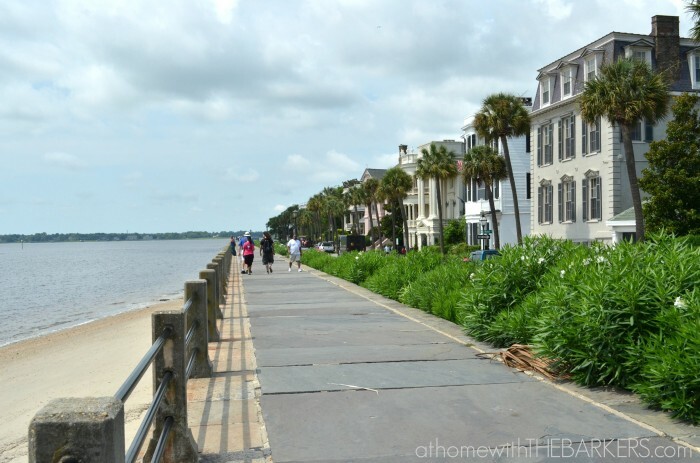 Sure, there are horse carriages and buses that can tour you all around the historic town BUT nothing compares to a walking for your Charleston tour. There is so much to be learned about history from Charleston but this isn’t history class. This is a decorating blog! 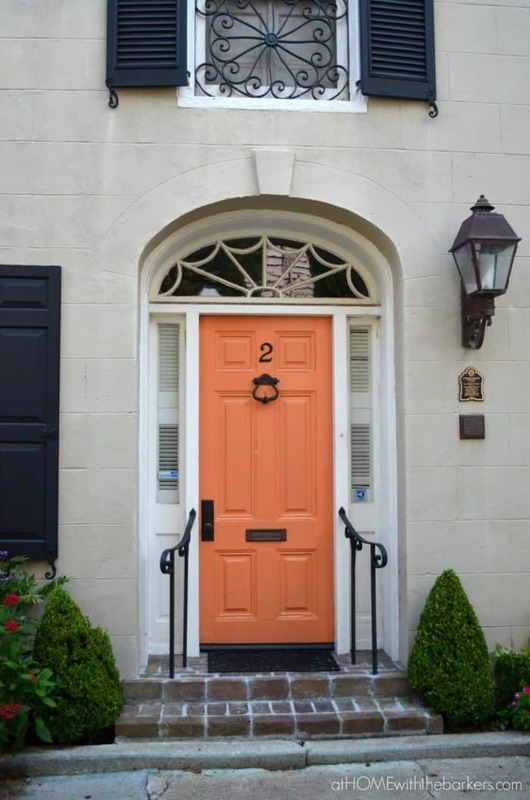 SO let’s look around at the beauty and inspiration that Charleston has to offer from gorgeous homes and architectural details, to colorful exteriors and grand window boxes. The worn brick and black shutters are so classic. Although Charleston is known for the pastel colored houses, this beauty totally caught my eye. The window boxes all overflow with beautiful plants and flowers. 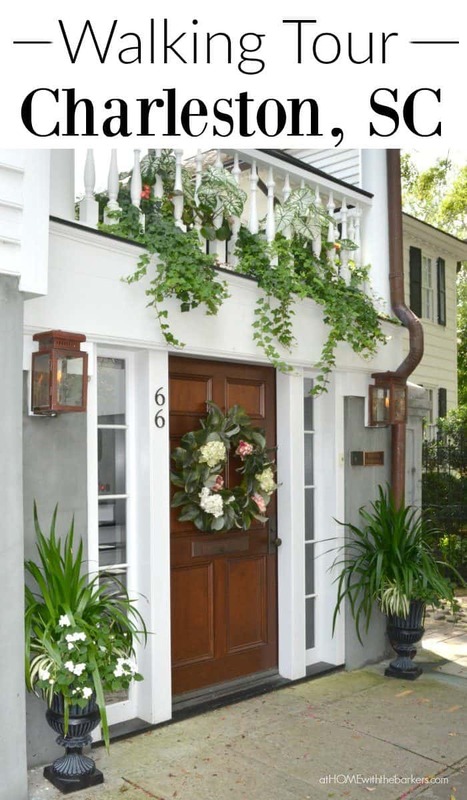 You can walk all around town and gain so much inspiration for curb appeal. The flowers and greenery are in such abundance. AND the colors are so vibrant! 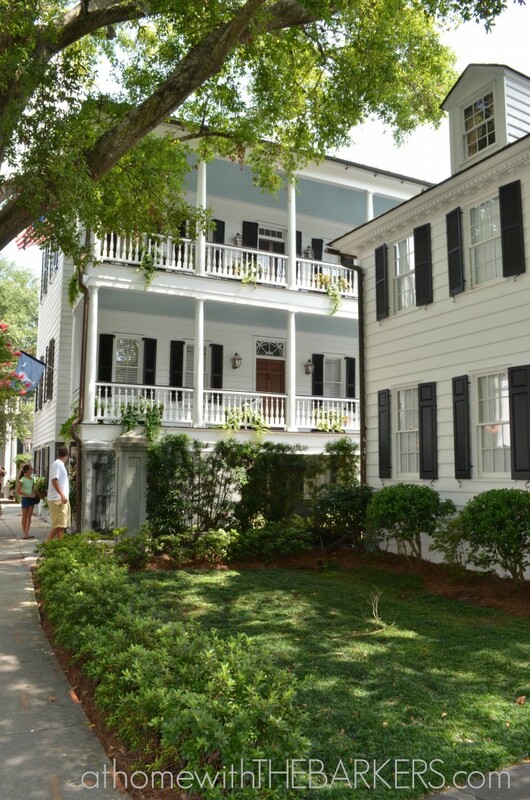 There is really something special about the way Charlestonians maintain their homes. 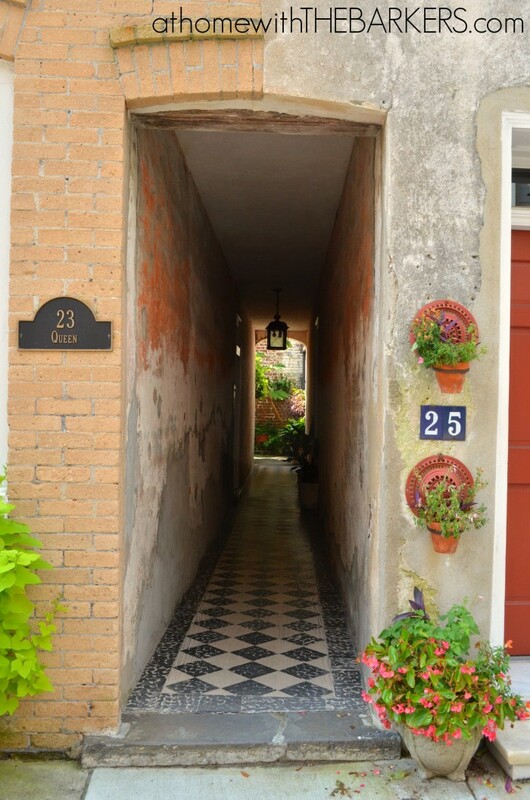 Whether there is a new coat of paint or a home has aged well, there is beauty everywhere. 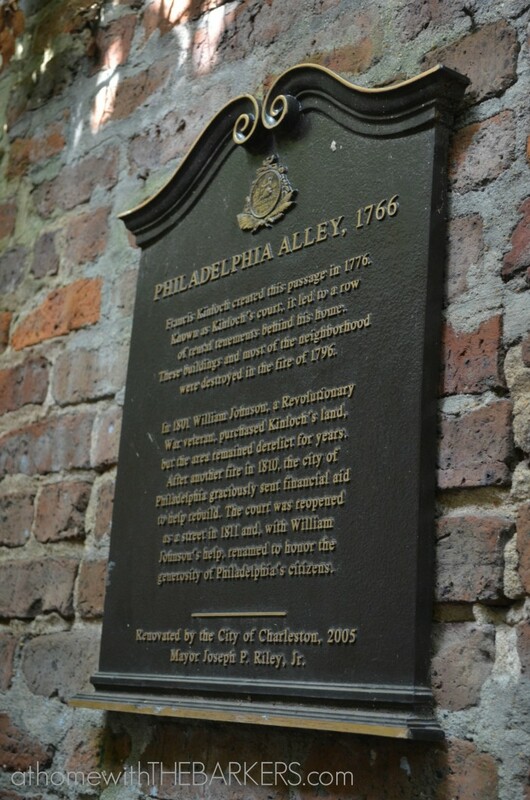 The walking tour was so great because we were able to get off the main streets and into alleys and remote places that you may not have walked on your own. Little paths that you wouldn’t think you could walk through. This garage door is gorgeous. I love everything about it from the stain color on the wood to the iron detail! Then there’s more window boxes to admire. This is actually someone’s home. A magnolia leaf wreath is true southern style. It seems as though Joanna Gaines has made the word magnolia popular but here in the south, magnolias are tradition. It’s the southern way. The homes are really big but they sit on very small lots. So the door entrance faces the street while the porch faces the neighbors. It’s a good thing we are friendly in the South! 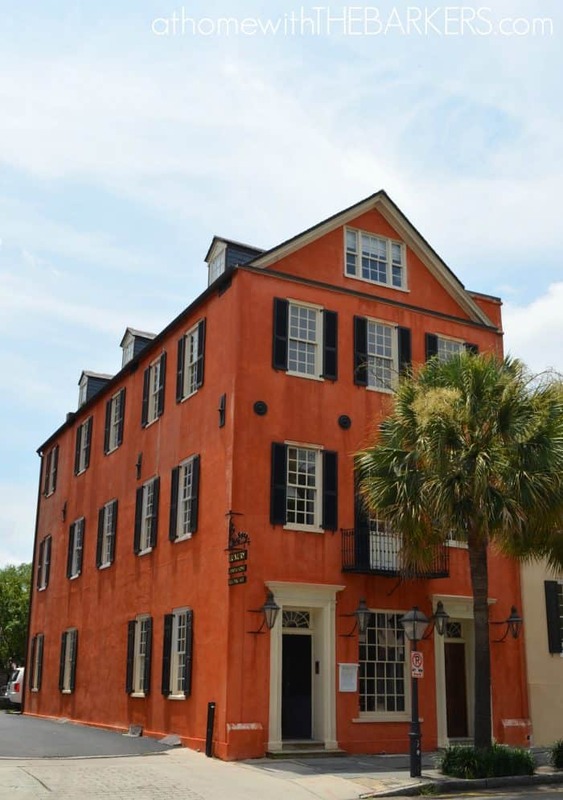 The Battery, on the tip of Charleston, is probably the most well known features of this low country town. It is as beautiful as you would expect. 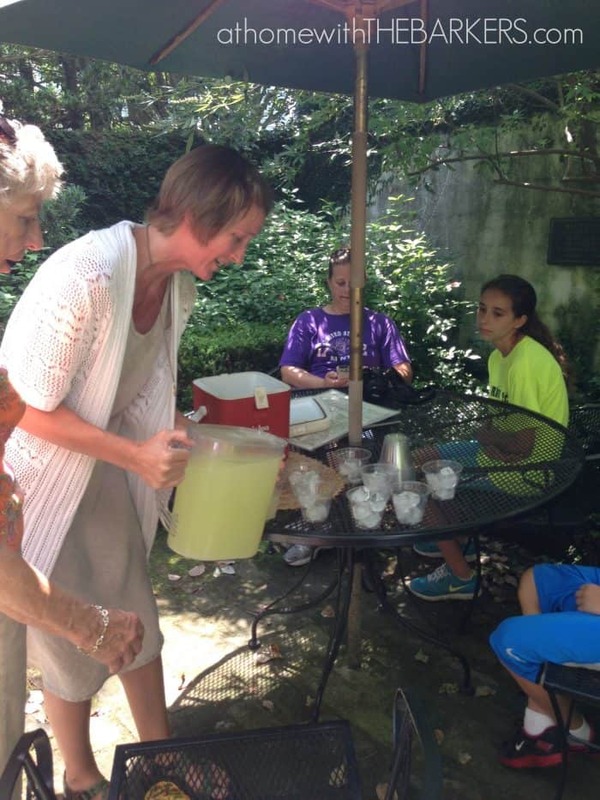 In true Southern hospitality style, our walking tour guide served us lemonade in the back yard of her parents Bed and Breakfast. It’s called the Middleton Bed & Breakfast. Yep, that’s how it’s done in the South! Her name is Anne Middleton Herron and she is a 13th generation Charlestonian. I would highly recommend a Charleston walking tour with Anne. Our family enjoyed the tour so much I told Anne I would be giving her a shout out on the blog. 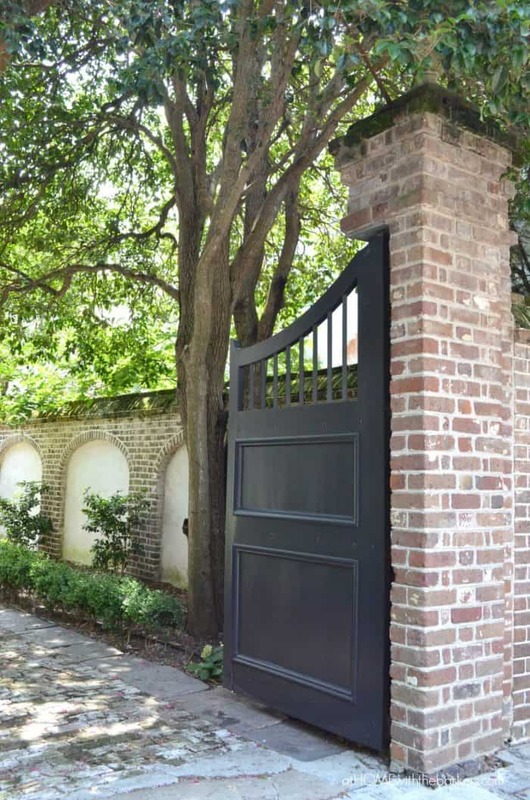 So if you are ever going to Charleston, take the walking tour with Anne. Go to her website here. Have you ever been to Charleston? What do you love most? Wow! That looks like fun… I’m in love with all of those homes, but that coral(ish) door in the very beginning is stunning. LOVE it!… and OH MY! 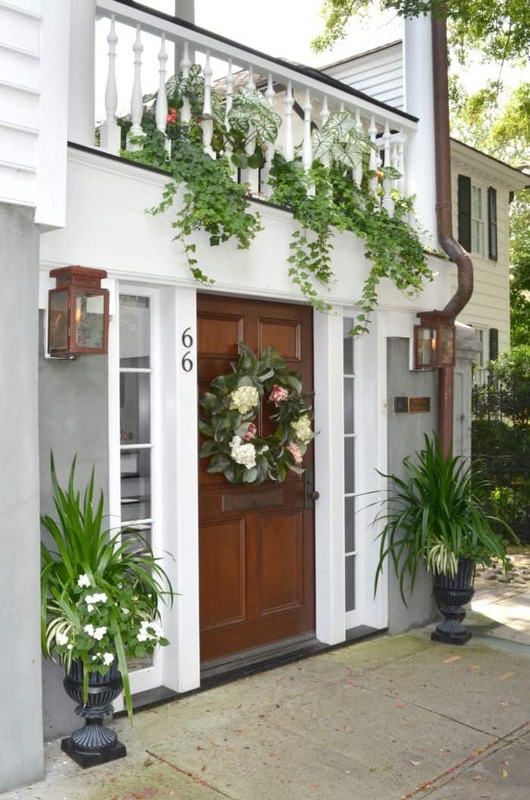 The home with the magnolia wreath is beautiful, too! So many details. I wanna visit Charleston, now! LOL! All I’ve ever known about Charleston is from books I’ve read. Don’t think I could take the climate there but would love to visit in winter if it’s cooler and maybe not so humid? We lived in Bowling Green, KY area for 5 yrs., eventually had to move away due to climate effects on my health, doggone it. Otherwise I loved so much there, especially our house, land about 30 miles north east of B.G. and availability of awesome vintage “stuff”. Not so here at all. (Grand Junction, CO area). The homes in Charleston and all are so beautiful. I’d love to see it all but sure enjoyed your photos. To me it’s very interesting to see actual homes, etc. that are a part of history. The colors certainly are vivid and picturesque. Looks like you had a nice day for your tour. That lemonade sure looks good. How nice. You would love it! You are right, Charleston can be super hot and humid. While it was hot when we were there, we had a much milder summer here this year with lots of rain. I’m sure we are about to make up for it. 🙂 But you should go during the fall, late October- November. Thank you, Sonya! I have always wanted to go to Charleston! Been to Savannah many times and love it but had a feeling Charleston would be just as sweet or sweeter. You really have me moving it up to the top of my Bucket List now! All your gorgeous photos have me wanting to look at our calendar and see when we can go! We’ll be sure to look up Anne for her wonderful walking tour! Visiting her website now to add to my contacts! Oh this is exciting! Go for it! I’d love to hear about your trip. Lovely photos! 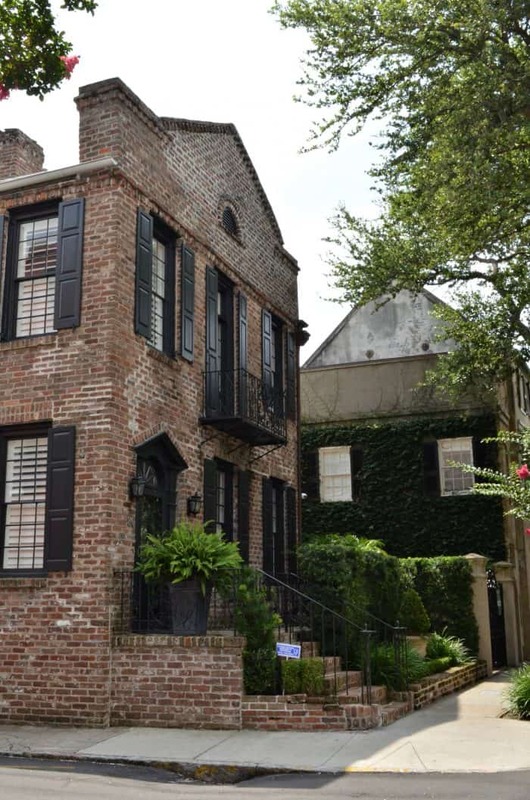 There is certainly some kind of historical and dreamy magic in the designs of Charleston houses. Coupled with its beautiful beaches, lovely scenery, and great restaurants, Charleston is definitely a good place to live in. Charleston, SC and Savannah, Ga. are two of my favorite places to visit. Now we have taken a carriage tour but you’ve convinced me that the next time we are there, we have to take the walking tour. I agree with your comment, you get to see more walking than riding in the carriage. I can tell by your pictures. Charleston is a very social town. When we were there when our children were small, it was almost dusk when we took the last carriage tour of the day and saw lots of couples walking to formal parties in their gowns and tuxedos or USN dress uniforms for the men. It seemed l like a fairy tale straight out of a book! Thanks for sharing this with us! I’m so glad you commented! As crazy as it is, I live less than 4 hours from Charleston and this was the first time I had been in 20 years! I love Charleston! My daughter lives there so I do visit from time to time and it is beautiful. My favorite thing is the Angel Oak Tree, which I try to visit every time I am there. It is absolutely breathtaking! I paint funky furniture, and my daughter and I usually end up doing projects more than sight seeing! Last time, We painted her living room, hall way, kitchen and eating nook, plus I did a big buffet side table redo that turned out great, and they are using it to put their tv on. So no site seeing that trip! The humidity can be a turn off (especially if you left your hair products home so you could get by with just a carry on for the plane,…and then couldn’t find them anywhere for sale there!) But it is a fabulous place, with wonderful restaurants! I enjoyed all the pictures you posted! We lived on James Island for years and years before moving to Lexington 10 years ago. Luckily 2 of our daughters still live in Chas and we get to visit often. I STILL miss it. Sonya- I am glad I read this post. I really want to get serious about planning at Charleston trip this fall. My kids are 10 and 8. Do you think they would enjoy it? I was thinking about staying on Myrtle Beach (there is a Marriott there and we have some free rooms coming). Is the beach close to these small towns you are talking about? Coming from Iowa, I really want to do the beach and the historical, little town stuff. Don’t know if that is feasible? Did you have a resource you used before you went? How did you plan what to do? Sorry for so many questions. You can shoot me an email too! Thanks so much! Thanks for sharing! We’re visiting Charleston this October and I have no idea where to begin. Thanks for the tips to help! You will love it! Great time of year to visit. My sister and I are going to Charleston in June. Would appreciate any travel advise you may have. Oh how I love Charleston!! What I love best is the architecture and the Spanish moss dripping from the trees. I’m totally enamored with the Low Country! I found this from Pinterest, Thanks for sharing. I am going to Charleston for the first time in September and booked her tour because of your review. Can’t wait to see this city I have heard so much (good) about! We’re Texans and fell in love with Charleston while our son was a cadet at The Citadel. He has graduated and it still is our families favorite place to visit. 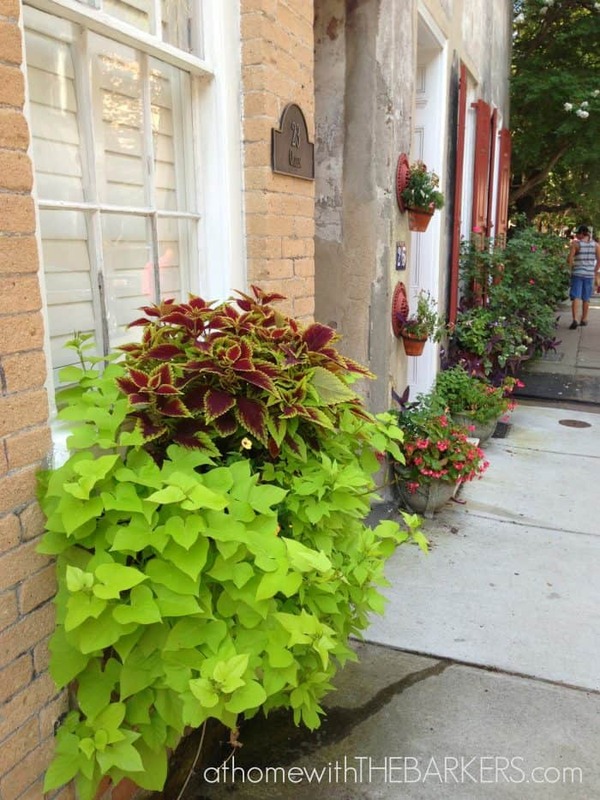 We will certainly take Anne of Middleton Bed and Breakfast’s walking tour. That sounds wonderful! Citadel has such a great tradition and campus. You will love the tour. Looks like we have cross state connections, our kids were born in Texas when my husband was in the Air Force. I am just loving these tours, another to add to bucket list. PS Barker is a family name, also from SC. Small world.